We are professional in making the completed automatic production line for metal ceiling, such as the 600*600 metal ceiling tiles machine, 300*300 metal ceiling panel machine, 1200*600 aluminum ceiling board machine, 1200*300 aluminum false ceiling machine, clip in suspended ceiling machine, lay in square ceiling machine. We have more than 10 years experience on the ceiling machines and mold. Our machines have exported to many overseas countries, and have good reputation. We have difference capacity ceiling machine, like 40 tons hydraulic ceiling machines, 60 tons hydraulic ceiling machine,100 tons hydraulic ceiling machine,120tons hydraulic ceiling machine…etc to suitable different ceiling size and different ceiling material. We also offer metal ceiling tiles mold with different size. We can provide the suitable solution of machine as per your requirement details. a. This ceiling machines work automatically. b. We could offer different machines and mold as per your requirements. c. We can make the ceiling machines produce different ceiling tiles just changing the mold, like. d. 300*300 ceiling tiles,600*600 ceiling panels, 1200mm*600mm ceiling. a. Years of experience----Pusheng Machinery have 17 years experience on the ceiling machines and mold. b. 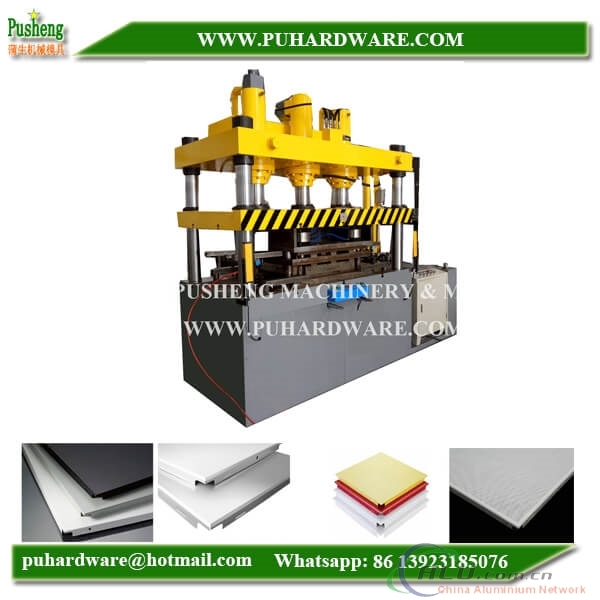 Performance----Pusheng Machinery use high quality machines to guarantee the ceiling quality. And it can use 10 years or longer. c. Operation----Pusheng Machinery full automatic line is operated by PLC with different languages. e. Technical support---- Pusheng Machinery 10 years technicians give you strong and timely support. Metal ceiling machine, for more details,please contact us at anytime.